Social networks are meant to be places where people can engage and share content that they find interesting. When you post something, you will want your followers to share them or discuss them through comments. This ensures that you brand is getting enough attention to increase its awareness. However, if you find that your posts are not engaging the customers, you may be making some mistakes. There can be a few tips that you can use to help improve the engagement rates of your posts. In order to make your posts in Facebook, you will have to first make them perfect. This can help you attract targeted customers with whom you can engage. Positive Content is preferable for the Facebook posts. Opt for posts that are interesting, inspiring, positive and humorous. Creating informative posts can be another suitable choice as they provide value to your followers. Images are tremendously excellent posts in Facebook as they get shared more often. Since people are more likely to access this social network through their mobile devices, you need to ensure that your posts can be easily viewed on those gadgets. Twitter is a hugely popular social network. Your tweets can be considered to be successful if you manage to reach even a fraction of the immense user base of the social network. It is essential to maintain proper grammar in your tweets even though you only get 140 characters for each post. Engage your audience by posting facts, figures and other small and useful information in your tweets. Tweets that have images are more likely to be clicked and shared. They are also more engaging. Do not forget to use appropriate hash tags or mentions in your tweets. A couple of them will suffice. If you are posting a call to action, then they should be clearly understandable. Google Plus is quickly becoming a stronger social network. Additionally, its features make it perfect for use by business owners. The posts in Google Plus should be informative and capable of showcasing your expertise. Images will certainly be beneficial in improving engagement rates. Try to focus your posts on topics that are currently trending. Attach the appropriate hash tags to improve the visibility of those posts. Instagram has quickly developed into one of the most popular social networks for people and businesses alike. It is different from other social media networks as only pictures and videos can be shared here. The images or videos that you post should be perfectly capable of engaging your audience. The images should be edited using filters that are appropriate for your business. it has been noticed that blue is a popular color with Instagram users. The users of Instagram also prefer images that possess a low saturation. The messages of the post are just as important as the images or videos. Using the appropriate hash tags will improve the visibility and reach of your posts. 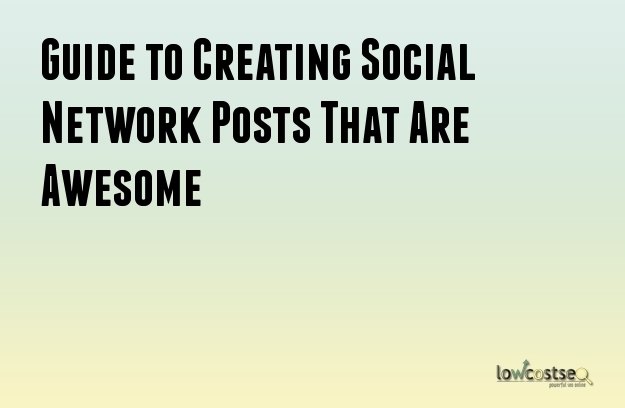 With the perfect posts, you will be able to garner a large following that engages and shares them.